Today, I am going to share top 10 best voice changer software for Skype. Using these voice changers, you can’t just change your voice from one form to another. But also, you can enhance your video calling experience by using the sound emojis to express your emotions. 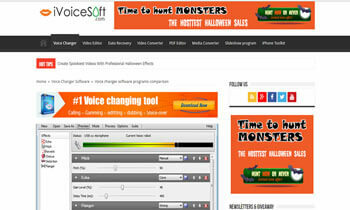 Can’t wait to know the best free voice changer Software? Let’s dig deeper into the article. 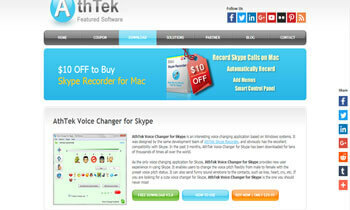 AthTek Skype Voice Changer is one of the best voice changing Software for windows. AthTek is a trustable Software development company which is known to provide amazing Software for various uses. Till date, AthTek has developed three voice modulation Softwares and the Skype Voice Changer is the first one among them. Skype voice changer is an easy to use and feature-rich Software which you would love to use. This Software is exclusively designed for Skype, thus it’s highly compatible with it. 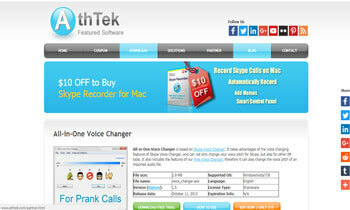 AthTek Skype Voice Changer offers great features which enhance our Skype video calling experience to a whole new level. Apart from the basic functionality of changing the voice from one form to another, AthTek Skype voice changer offers the cute sound emojis to enhance our video calling experience. Using these emojis, you can express your emotions like love, heart, kiss, cry, anger etc. AthTek Voice changer is free with the basic features. If you want to attain the complete features of this Software, you need to buy it. Skype Voice changer is the best voice changer software I’ve ever come across. It’s extremely powerful and handy software which offers amazing features. 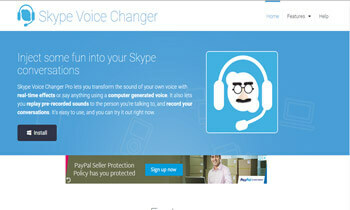 The Interface of Skype Voice Changer is straightforward and anyone can use it without any technical knowledge. The Skype voice Changer is superior to most of the other voice changers in many ways. With this Software, you can change your voice with real-time effects. Some of the effects include a robot, deep sound, Echo, Wobble, chipmunk etc. The Skype Voice Changer is the best voice changing Software not just because of its feature of Voice modulation. In fact, it’s just another feature offered by it. The best part of this Software is, it allows to preview the sound effects before making a call. Besides, you can also adjust the parameters during the call. In addition to this, you can also use the pre-recorded sounds in your Skype calls. You can play sounds like Sheep, sad trombone, crash in the real-time and play pranks with your friends. The free version of Skype Voice changer offers limited inbuilt sound effects. But if you go premium, you can import your own soundtracks if you wish to. Besides that, Skype Voice Changer Pro also lets you record your conversations on Skype. With the premium version, you can record your full calls, while in the free version, only first 30 seconds of a call can be recorded. Another best feature of this Software is speech synthesis. With this Software, you can speak as the computer-generated voice by writing out the text only. AV Voice Changer Software is the best voice changing Software. But it’s not suitable for all range of users since it’s an advanced level software. With this Software, you can change your voice from one form to an extremely different form to amaze people who you are video calling with. 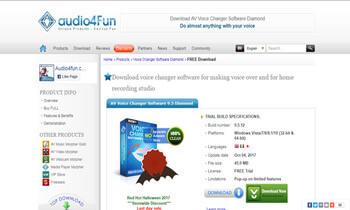 AV Voice Changer Software Diamond works as a voice editor, Voice Morpher, Voice Recorder, File Morpher and more. It offers 30 Voice Effects, 70 Background Effects, 17 Non-human Voices, 40 plug-in Audio Effects and the list of offerings by this Software is long. If you are thinking that AV Voice Voice Changer is Free, then you are somewhat wrong. AV Voice Changer is a premium tool, which costs you about $99 for the lifetime. However, they keep offering the discount codes to make it more affordable. But before paying for the asked amount, I would recommend you to download their 30-day free trial version. If you find it worthy, then you can anytime go premium. And if you want advanced features in your voice changer Software, there are two versions which you can choose from i.e AV Voice Changer Software BASIC and GOLD. These Softwares are cheaper than the DIAMOND version. So make sure you choose your desired Software version wisely. 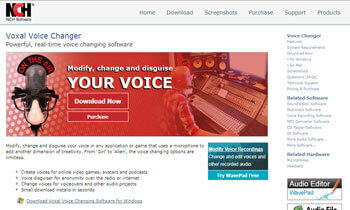 Voxal Voice Changer is my next pick for the best voice changing Software. Why?? Because Voxal Voice changer has all the features that make it one of the top Voice Changers of all time. Unlike most of the other voice changers, Voxal Voice changer lets you change the voice in the pre-recorded audio files. It’s a great feature when you want to change voice-overs in different voice tones for different projects. Besides that, the Voxal Voice Changer offers a Vocal effect library which includes different sounds effect including the robot, girl, boy, alien, ethereal, echo and many more. Apart from all this, another plus about the Software is being its light-weight. The Voxal download file is really small and it hardly takes more than a few seconds to download completely. For the same reason, it offers low CPU usage. And it doesn’t interfere with the other applications and runs smoothly on the mediocre computers. There is every single feature offered by Voxal Voice Changer that we want to see in our best voice changer from an easy interface to real-time voice changing effects, synthesize feature to convert text to voice and more. However, it’s a premium software but it’s worth paying for. But before going premium, I would suggest you to use the trial version first and check, whether it fulfills your requirements or not. The next best voice changing Software in my top 10 list is MosqVox Voice Changer. It’s yet another great tool for changing your voice from male to female, female to male and to any other desired form. MasqVox is really easy to work with. And it works great with Skype for changing Voice. This program modifies your voice in real-time as you speak into your microphone during a Skype call. Not just Skype, MosqVox is compatible with most of the chat applications including Facebook Messenger, Hangouts, TeamSpeak etc., to any application that uses the microphone. That’s not it. 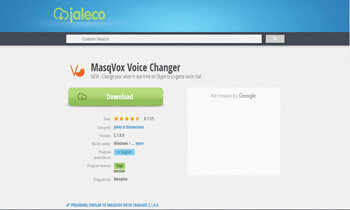 MasqVox also lets you modify your pre-recorded audio file. This way, this Software turns out to be a handy tool for the once who want different voice tones for voice-overs and other audio projects. So in a nutshell, it’s a great voice changer Software, which offers a high range of voice diversity with least possible efforts. 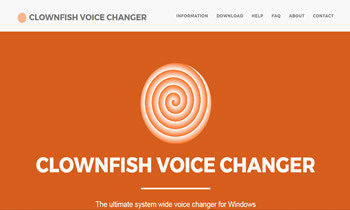 Clownfish voice Changer is an amazing voice changer tool for Skype users. It’s a great tool for basic as well as mediocre users. If none of the above software has satisfied you so far, you can give clownfish voice changer a try. The Clownfish voice changer is installed at the system level. And that’s the reason, it works on plenty of other IM tools like Steam, Hangouts, ooVoo, Viber, Ekiga, Jitsi, Ventrilo, TeamSpeak, Mumble etc. other than Skype. There is a long list of voice effects that are supported by Clownfish which includes Alien, Atari, Clone, Mutation, Male pitch, Silence, Female pitch, Helium pitch, Radio, Robot, Custom pitch etc. The best thing about Clownfish is, it works great on all version of windows including Windows Vista, Windows 7, 8, 8.1 and Windows 10. So you can download and use Clownfish voice changer for skype regardless of the windows version you use. Do you have any more doubts about being Clownfish as the best voice changing Software?? I guess No. Now let’s move further to the next best voice changer. 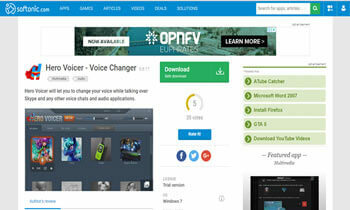 IVoice Voice Changer is yet another best voice changing Software on the list. It lets you change the digital voice by changing characteristics of voice. With this Software, you can change the voice frequency, timbre (Tone Color), pitch, period etc. IVoice Voice Changer is an Excellent Voice changer for all range of users eg. basic, advanced and expert level. In the basic level, you transform your voice from one form to another and export changed voice as an audio file. Besides that, there aren’t any additional features. While at the Advanced level, you can change more characteristics of the voice to produce the most natural-sounding. Also, you can use the voice changer on other VoIP tools like Instant Messaging programs, games, chat rooms, Recording tools and nearly any tool that supports microphone. And the Expert level is empowered with high stream features. Some of the features are like Changing voice in real-time, Support audio effect preset, Make parody voice. Compare 2 voices, Include voice optimization toolkit etc. All-in-One is yet another best voice changer for Skype. Like the AthTek Skype Voice Changer, it’s yet another AthTek product which is slightly different from the first one. Unlike AthTek Skype voice changer, All-in-one voice changer is not exclusively designed for Skype only. In other words, All-in-one Skype voice changer is an excellent alternative to AthTek SKype voice changer to use it on other IM tools on the Internet. 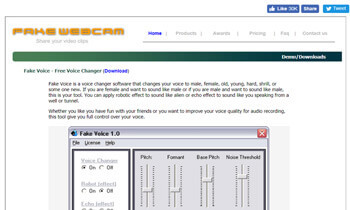 The rest of the features of this Software are similar to the Skype Voice Changer. The features include high compatibility with Skype, easy Interface, the ability to use sound emojis etc. Moreover, you can also use this voice changer to change the voice of the external files. For instance, if you have pre-recorded sounds in WAV/WMA/OGG/FLAC/mp3 file formats, you can import it on All-in-one Voice changer, change the voice as per the Instruction and export the file as the *.wma file. So it’s definitely the best voice changing Software you can go for. If you are impressed with the AthTek voice changer and want to use it on other IM tools, just download and use All-in-one Voice Changer! Have you ever thought of sounding like your favorite anime character during a Skype call?? If yes, then this voice changer is just for you. With Hero voicer, you can change your voice from your own voice to various Characters on online games and TV shows. Hero Voicer is the best Software to play a prank with your friends and enjoy the Skype calls. With Hero Voicer you can adjust voice settings, make your own voices, change your voice to the famous creatures. Apart from this, you can also use the background sounds to enhance your video calling experience to the maximum. Hero Voicer lets you change your voice, not with just Skype but any other voice chats and audio application including Teamspeak, Raidcall, Ventrilo etc. You can only know more about the software, once you try your hands on it. So I would recommend you download this free software from the above-given link and give it a try! If you are looking for an extremely basic and a Free voice changer, you can give Fake Voice a shot. It’s a free Voice Changer Software, which I will call the best voice changing Software only for the once with basic needs. You can’t use your pre-recorded sounds on Fake voice, you can’t use additions sound emojis to express your sounds either. But it indeed does what it’s meant for. Meaning, it lets you change your Voice from male to female, female to male. Also, it can make you sound hard, shrill, old or a young person. Fake voice basically offers three effects i.e Voice Changer, Robot effect and Echo effect to sound like you speaking from a well or tunnel. In each sound effect, you can set the pitch, format, base pitch, and noise threshold to sound with your desired voice. So all in all, it’s a good Voice changer which can be given a try. The best part is, it’s an entirely free Software which you can download for free from the official website. So these are my top 10 picks for best voice changing software. This list will surely come out to be handy when you have planned to play a prank with your friends. By using these Voice changers, you can make your skype conversation far more entertaining and funny than before. Skype is really good in many perspectives. But if there were an inbuilt online voice changer on Skype, the things would have been much better. But again, these best voice changing Software mentioned above are sufficient to overcome this Skype Downfall. With this, I’m done with the article. Now, you can leverage any of the above-mentioned software and change your voice during skype calls. You can even use pre-recorded voices through the Software, use background voices and there are a lot more features which you can use. If you have any questions, suggestions or queries, do let me know in the comment section below.